A Digital Twin of A Single Machine, That’s Easy! Gartner Group called the “digital twin” one of Gartner’s Top 10 Strategic Technology Trends for 2017. Gartner’s Marc Halpern followed up this prediction with Busting the Myth of Digital Twins and Planning Them Realistically, presented at PDTEurope in October 2017. In his presentation, Halpern described some of the characteristics of a digital twin, often using OEM machines or vehicles as examples. Typically these machines are identically manufactured equipment like motors or vehicles, some coming from the factory with OEM digital twin models. A digital twin of a mass produced machine is relatively easy, when compared to real-life assets like real estate portfolios or city infrastructures. view into assets — based on your business objectives.” The goal changes from keeping a single machine operating, to efficiently running a complex ecosystem. In a complex ecosystem there may be thousands or even millions of individual assets requiring twins, and these twins must be integrated into the business processes of thousands of stakeholders, each engaging with the asset to meet multi-stakeholder business objectives. For individual enterprises, integrating digital twins into business processes may be impossible without radical transformation of their own existing processes. For Smart Cities to become a reality, entire cities will need to become part of a secure, connected and collaborative digital ecosystem. It has to happen, and it’s happening now. Measuring the financial ROI of actions taken as a result of insights gained from the digital twin. To solve these challenges, we digitize business processes, (i.e. starting on the IT side of the twin), creating a platform of digital twins outside of the enterprise. Enterprises can share digital twins within this ecosystem, exchanging data with other stakeholders, while securely controlling the data that they exchange from within. 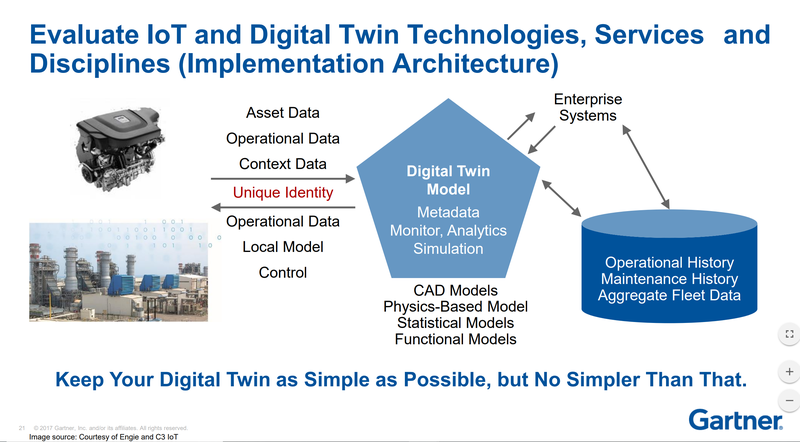 Note: For security purposes, digital twins MUST exist outside of the enterprise, in a platform where each twin of equipment (whether it’s a truck, motor, boiler, pump, chiller or exhaust fan) can be related to other twins and aggregated across entire fleets or facilities portfolios. Our platform is multi-enterprise, connecting stakeholders securely at the twin level, with each twin integrated into the business processes of each individual stakeholders. BuiltSpace has built this platform, already with digital twins of thousands of buildings with supporting business processes transforming how equipment, buildings, and eventually cities, are managed. Visit us at Realcomm/IBCon, booth 1901, on June 6-7, at the Cosmopolitan in Las Vegas.